If any of my readers have ever had open abdominal surgery they will understand the importance of these words, Cough*Sneeze*Laugh! I'm sure they are associated with the pain and discomfort you experienced when you did any of these normal everyday occurrences during your recovery period. My sister had surgery a few days ago as the beginning of her treatment for uterine cancer. She had a full hysterectomy and the surgery was done as an open surgery so the doctor could check all her surrounding organs for any signs of cancer. I am happy to report that he did not see any other cancer when he had her opened up. Now we wait to get the full pathology report, next week. I wasn't going to make her anything right now, but 24 hours before her surgery I got an idea and went about creating it like a mad woman! 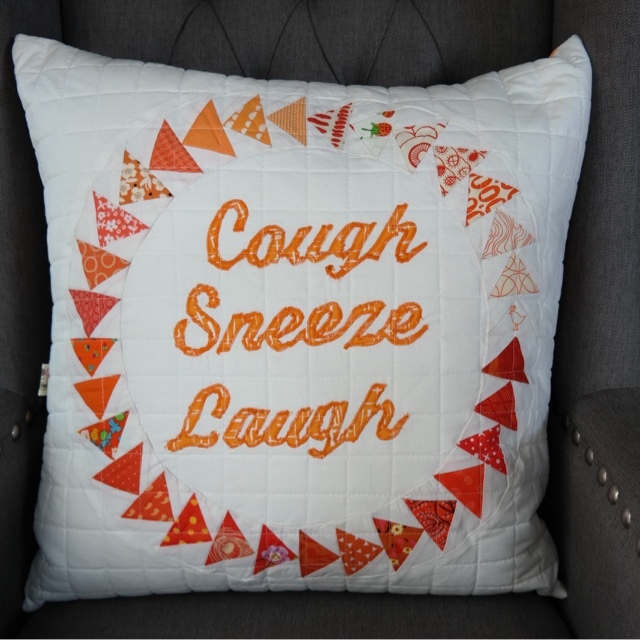 I wanted to make her a pillow to hold when she coughs, sneezes or laughs because I was told from other friends who had surgeries in the past that holding a pillow to the abdomen helps so much with the discomfort associated with doing these things. I also decided that a circle of flying geese would remind her that she has lots of friends and family circling her with love, prayers and positivity as she faces the coming weeks and months in her battle to F*%K Cancer! I found this paper pieced pattern on Pinterest. It was supposed to finish at 6" but I enlarged it a bit so it finished at 7.5". I made 4, then used the piecelique method to attach the geese arcs to one piece of fabric, so there would be no seams in the center circle or the background fabric. I was recently made aware of the fact that the color associated with the fight against uterine cancer is orange, so orange it would be. It's a good thing I am not lacking in orange fabrics. 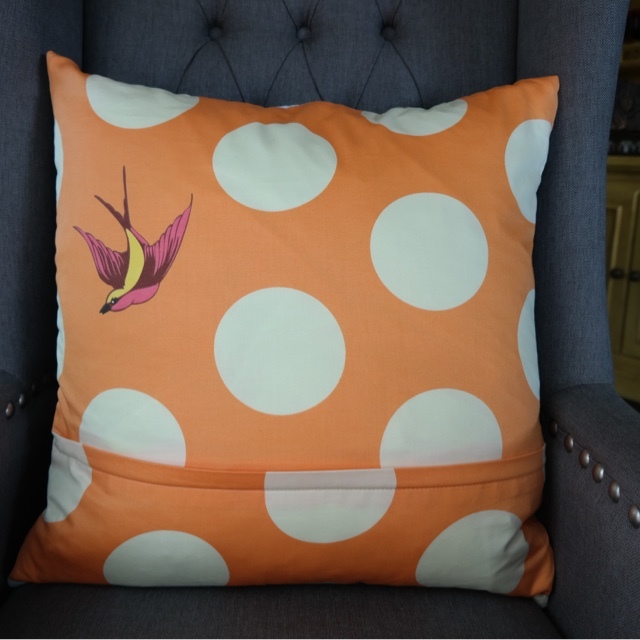 I would say orange is one of my favorite colors and I have a lot of orange fabrics to choose from. For the words, I wrote them in Photoshop Elements, found a good script font and then flipped it horizontally, so the words were on the paper backwards. 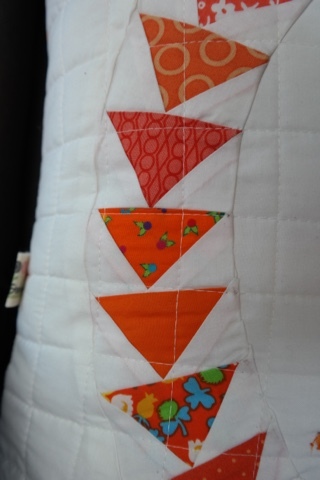 Then I printed the document onto a sheet of Steam a Seam, Lite, fused it to an orange fabric and cut it out. 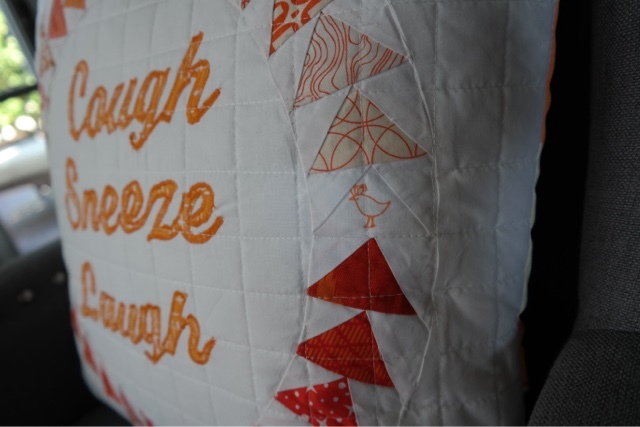 Then I zigzag stitched around the letters. I wish I knew how to use the embroidery feature of my Bernina 820, but I have no clue how to use. I still need to take that class. Because I was running out of time, I quilted it with a grid.using Aurifil white 50 wt. thread. For the backing fabric, I had a few pieces of Tula Pink's Free Fall left over from a quilt backing. None of them were wide enough so I had to piece the back and place the zipper across the back of the pillow. I did a flap cover on the zipper. Even though I didn't have enough to match the dots, I'm still happy with the backing, because it is the perfect color and the bird symbolizes flight, and freedom and peace to me. 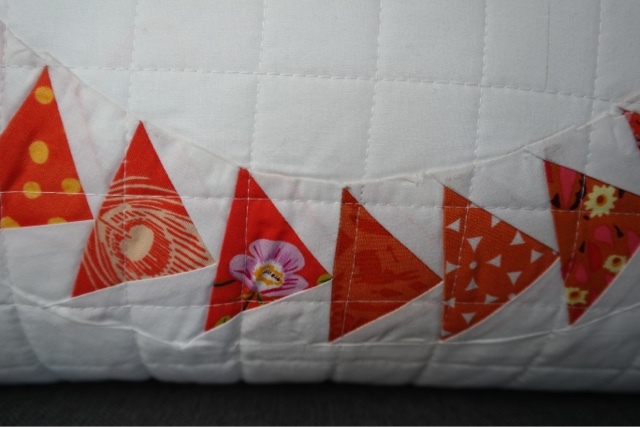 I started with white fabrics with orange print and then gradually built on the color going from light orange to dark orange. I was leaving to go to the hospital at 2:30 in the afternoon, and I finished the pillow at 2:10! It turns out I didn't need to hurry because Geri was not up to seeing visitors after surgery. I stayed away one more day to let her rest. Today I got to see her and I gave her the pillow and she loved it! The pillow fits a 20" pillow form. I must get to IKEA and buy more of their super squishy pillow forms. I took this one out of a pillow I had in my house. I love this gift Di. And the symbolism of the geese is wonderful. Give Geri very gentle hug for me next time you see her. Really sweet! I'm sure your sister will appreciate having it nearby for more reasons that one! BTW, I just recently heard the term piecelique for the first time - basically the technique used with the infamous 6-minute circle? 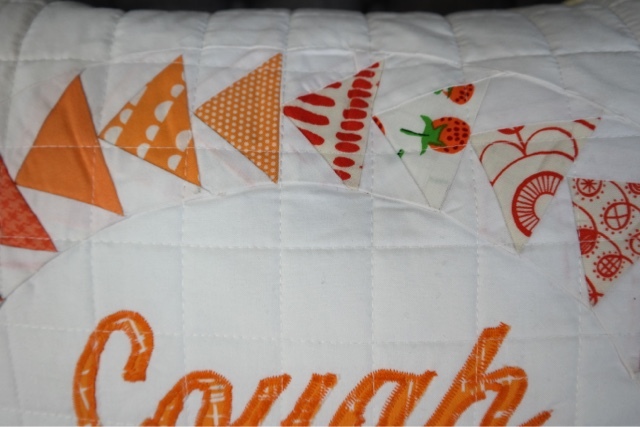 A quilter with a mission is not to be trifled with! Great job seizing inspiration when it came to you. Wishing your sister a speedy recovery. What a great idea !! the pillow is fantastic and so useful for this situation! I wish your sister a speedy recovery and a return to good health!! Your sister will be the talk of the hospital unit! If the gift shop gets wind of your pillow, they will want you to make some for sale! This is a nurse talking here, but this pillow really will be a big help for your sister. I wish her a speedy recovery with many blessings sprinkled into her journey to wellness! Your family needs a break from hospitals. What a wonderful present and filled with such love! Thank you so much for this Beautiful 😍 gift. The symbolism behind every detail is so touching and means even more that it comes from my sister. It's in my lap right now and when I'm not doing any of those things it's great for propping up my laptop or iPad so they don't dig into my incision. Thanks to all your wonderful friends. I feel your hugs.